Pictured (right) is John J Audubon’s illustration of the California Turkey Vulture, today commonly referred to as the California Condor. This hand-colored lithograph is Plate #1 from the Octavo Edition of Birds of America – created from 1840 to 1844. “Of the three species of Vulture which inhabit the southern parts of North America, this is so much superior in size to the rest that it bears to them the same proportion as a Golden Eagle to a Goshawk. It inhabits the valleys and plains of the western slope of the continent, and has not been observed to the eastward of the Rocky Mountains. Mr. TOWNSEND, who has had opportunities of observing it, has favoured me with the following account of its habits. In a subsequent notice, he continues:–“I have never seen the eggs of the Californian Vulture. The Indians of the Columbia say that it breeds on the ground, fixing its nest in swamps under the pine forests, chiefly in the Alpine country. The Wallammet Mountains, seventy or eighty miles south of the Columbia, are said to be its favourite places of resort. I have never visited the mountains at that season, and therefore cannot speak from my own knowledge. It is seen on the Columbia only in summer, appearing about the first of June, and retiring, probably to the mountains, about the end of August. It is particularly attached to the vicinity of cascades and falls, being attracted by the dead salmon which strew the shores in such places. The salmon, in their attempts to leap over the obstruction, become exhausted, and are cast up on the beaches in great numbers. Thither, therefore, resort all the unclean birds of the country, such as the present species, the Turkey-Buzzard, and the Raven. The Californian Vulture cannot, however, be called a plentiful species, as even in the situations mentioned it is rare to see more than two or three at a time, and these so shy as not to allow an approach to within a hundred yards, unless by stratagem. Although I have frequently seen this bird I have never heard it utter any sound. The eggs I have never seen, nor have I had any account of them that I could depend upon. CATHARTES CALIFORNIANUS, Aud. Birds of Am., pl. 426,; Orn. Biog., vol. v. p. 240. CATHARTES CALIFORNIANUS, Bonap. Syn., p. 22. 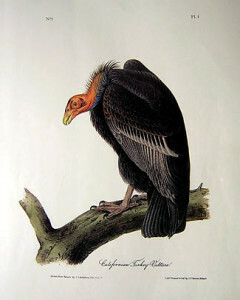 CALIFORNIAN VULTURE, Nuttall, Man., vol. i. p. 39.